Where do we get our modern technology from? Bill Salus: I want to circle back to Daniel 12:4. We know that this passage probably has technological applications since it says that knowledge shall increase as people run to and fro. But, do you think it also alludes to the fact that there will be better discernment of Bible prophecies? Do you see that a generation that will need to discern prophecy especially in the end times will see and understand what the signs are around them are pointing to, such as for instance Ezekiel 38 and 39 when Russia, Iran, Turkey, Libya, Ethiopia, a consortia or nine populations someday come together to invade Israel? Today, we are seeing those political relationships grow stronger then ever. We are seeing that Russia is supplying arms to almost all of the Ezekiel 38-39 invaders. We can now look at these political evens and also look at Ezekiel's prophecies and conclude that must be what Ezekiel was talking about. This could be a near event. We develop deeper insights as we see the stage set around us and these prophetic relationships being formed. We can today actually start discerning some of these prophecies these prophets were trying to tell us about. Is that how you see it as well? Nathan Jones: It is amazing that as one invention is created another one piggybacks off of it and so on. I firmly believe, especially since reading about the people who put the atom bomb together back in WWII who were getting ideas and inspirations that seemed to just come out of nowhere, that this huge technological shift we are witnessing first-hand is God-oriented. God is the one prompting us in our advancement of technology. That very astounding scenario also acts as a sign pointing to the soon return of Jesus Christ. This is confirmed in that we are even told in Daniel that technology would increase the closer we got to the Lord's return. Technology is a fruit of knowledge, but where does that knowledge come from? It comes in part from our God-given ability to learn and our ability to use of that knowledge prodded along by the inspiration He gives. I have heard that back in the 1800's if a person read an entire New York Times newspaper that would have been all the information that they would have read in their entire lifetime. Today, if you are a reader we go through hundreds of articles and educational TV shows and media each week. We then pass that knowledge around between ourselves and then we build off that ever expanding knowledge base. Also, our knowledge and understanding of Bible prophecy increases, especially as all these end time signs come together, like as you said in Ezekiel 38-39 where the nations coalesce into what they are supposed to be as end time players. As the European Union rises and as the Muslim nations unite, the pieces are all coming together. We can now read the Bible and declare, "Ah, I see what it was that Daniel wanted to know!" Daniel was stuck asking the angel, "You know, I want to understand this." But, the angel replied, "No, it is for those people when knowledge increases. They'll start understanding it." Well, Bill, I say right now — today even — that we are living in the very time when we are seeing that knowledge coalesce so that when we read the Bible we are like, "Yes, that makes sense." For hundreds of years people have not understood this — Israel is a nation once more. That matters! I also believe that the Holy Spirit is using that revealed knowledge to help us understand the Bible better, which increases our faith and gets us among people like on the Internet to put the Gospel out there in the short amount of time that we have left before Jesus' return. Bill Salus: Right! When you talk about Israel being restored as a nation, it's because Israel is God's end time piece. That is the way I always look at Israel. We are starting to see that since Israel has again become a nation and the Arabs have protested its return. Interestingly, there is an Arab confederacy in Psalm 83. We are also seeing that Iran is trying to build nuclear technology and Iranian President Ahmadinejad has said that he wants to wipe Israel off the map. That sounds like it has a potential Ezekiel 38 ending as well. So, Israel is sort of a provocateur of our understanding these types of political events. 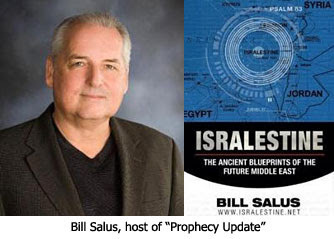 In the next segment of this interview with Bill Salus concerning Bible prophecy and technology, we'll look at some technology that will be used during the Tribulation. Israel is the barometer to knowing just how close we are to Christ return. As it goes with Israel, so goes the rest of the world. God can't make it any clearer to us that he is coming very soon. How awesome to know that shortly we will be with our King!